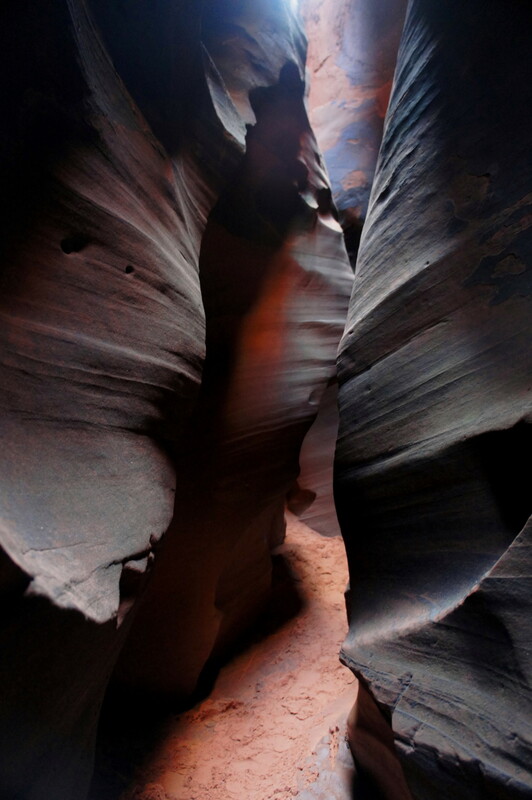 Each year, thousands of adventurers flock to beautiful Peekaboo and Spooky slot canyons in the heart of Utah’s Grand Staircase-Escalante National Monument. Just to the east, however, less than an hour’s walk from the mouth of Spooky, lies a bigger, badder alternative. Arguably the most astounding slot in the area, Brimstone Gulch is deeper, darker, and narrower than its oft-visited neighbors. 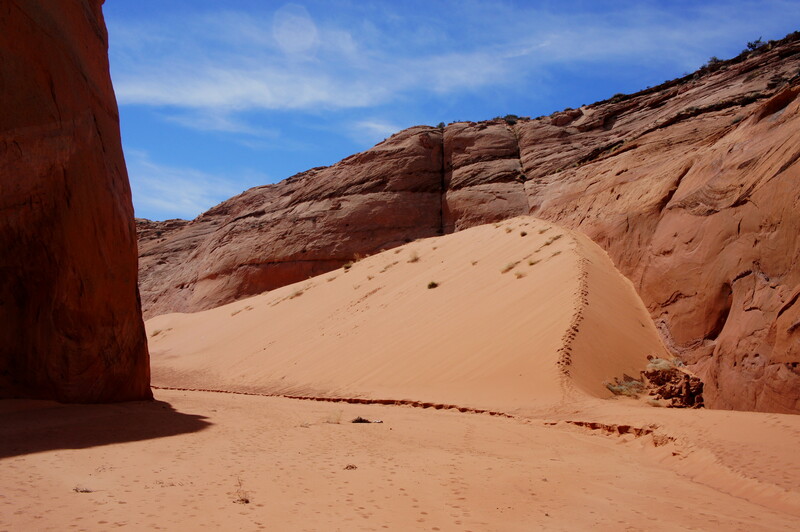 While the conventional loop through Peekaboo and Spooky will be sufficient for some, those with extra time and energy should not miss this shady, tantalizing crack in the Navajo sandstone. 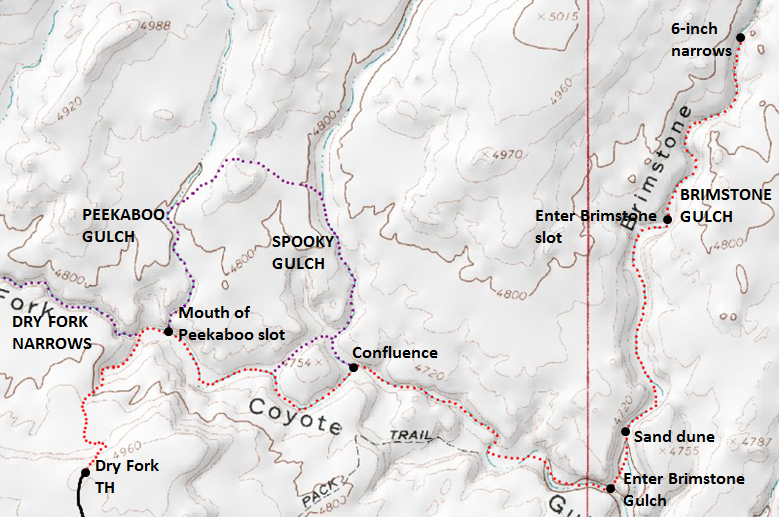 Like Peekaboo and Spooky Gulch and the Dry Fork Narrows, the access point for Brimstone Gulch is at the Dry Fork Trailhead, located at the end of a bumpy, rutted 1.6-mile spur road. To reach this point, drive 26 miles down the graveled Hole-in-the Rock Road, and turn left at the sign for Dry Fork. (Note: check latest road conditions here.) Continue up the spur road as far as you are comfortable—drivers with two wheel-drive and poor clearance will want to park about 0.7 mile up the road, after which the track turns considerably more rugged. Better-equipped cars may park at the trailhead. 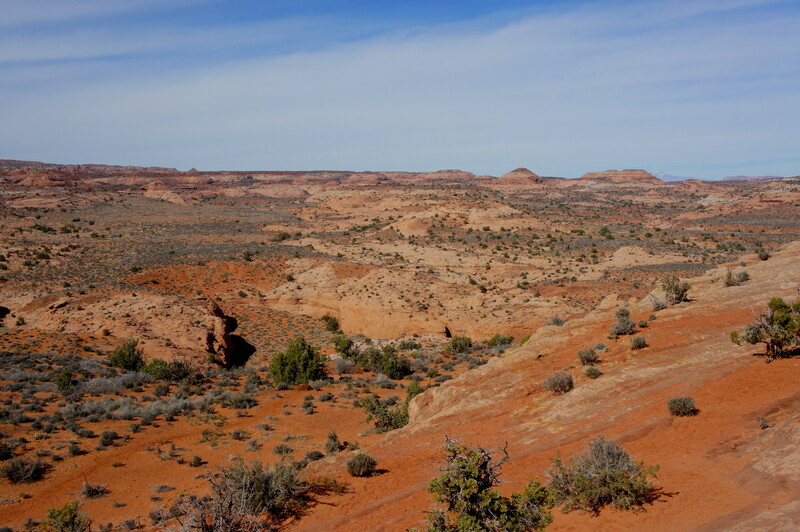 The Dry Fork Trailhead is situated on the precipice of a shallow canyon carved by the Dry Fork of Coyote Gulch. Access to the wash bottom is steep but relatively straightforward: follow rock cairns down a series of slickrock benches, then catch a well-worn sandy path leading down into a minor ravine. This wash quickly merges with the Dry Fork, about ½ mile from the trailhead. From this confluence (where the mucky brown clay of the Dry Fork meets the peach-colored sand of Spooky), it is a little over a mile to the start of the Brimstone slot. Fortunately, there is plenty of entertainment along the way. 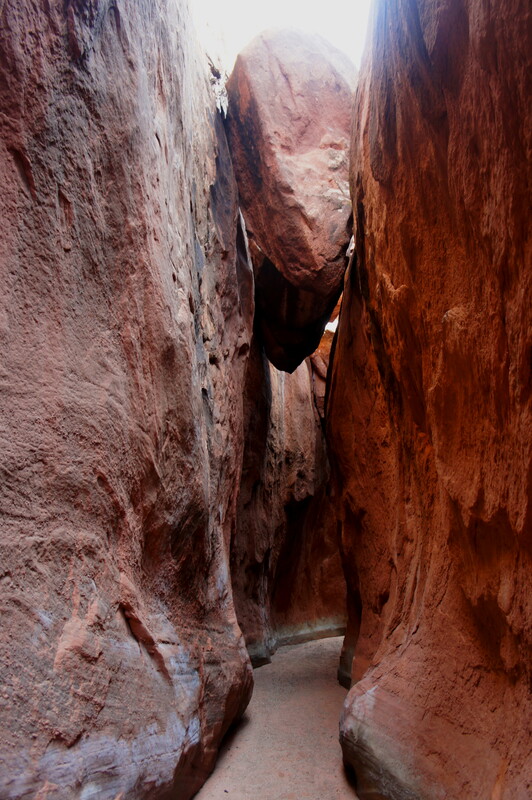 Continuing east (down-canyon) in the Dry Fork, the dry wash weaves through two sections of narrows. The first is short and includes no obstacles. The second, a few minutes farther, thins to around 4-5 feet wide and contains a large boulder that is relatively easily bypassed on the right or left. Then, a peculiar sight: four arrow-shaped chockstones, all within 50 yards of one another, caught in the upper reaches of the narrows. Hikers will pass under them each in turn. The hiker trail leads through a minor ravine, then drops into the much wider Brimstone drainage. Up ahead, a high sand dune hugs the canyon’s western flank. From the confluence of Brimstone and Dry Fork, it is a little over a ½ mile walk to the start of the narrow slot. Beyond the sand dune, a hiker trail cuts a left-bending meander, then continues up the main wash. Look for evidence of snakes, lizards, kangaroo rats, and other creatures that have left their mark in the sand. All of a sudden, 6/10 mile up Brimstone Gulch and 2.6 miles from the trailhead, Brimstone constricts to a narrow slot. 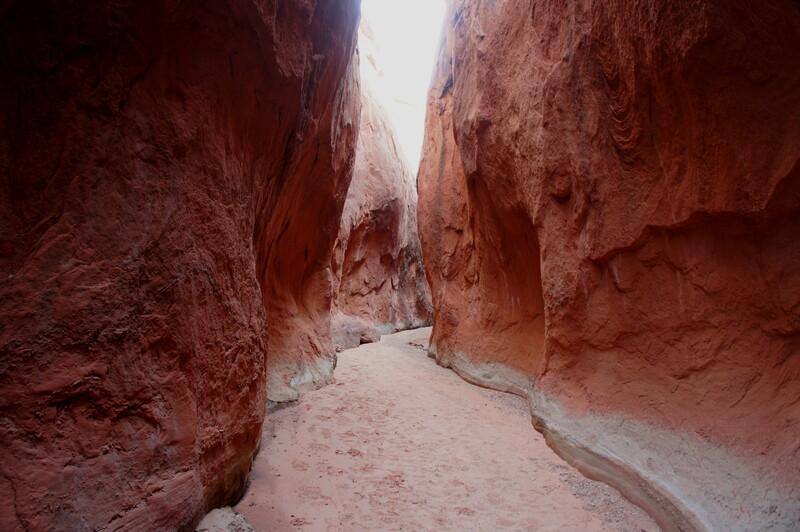 What was just a few minutes down-canyon a broad, sunny expanse transforms into a dark, shady passage. Striated cross-beds and solution cavities add texture to the canyon walls, now so close together that it is possible to touch both sides at once. Early on, the sandy surface dips into a shallow pit of sorts—after recent rains, it is possible that this will be filled with water. (Note: It was dry when I hike Brimstone in March 2015; it had not rained/snowed for several weeks.) Aside from the possibility of small muddy pools, this first stretch of narrows is without obstructions. 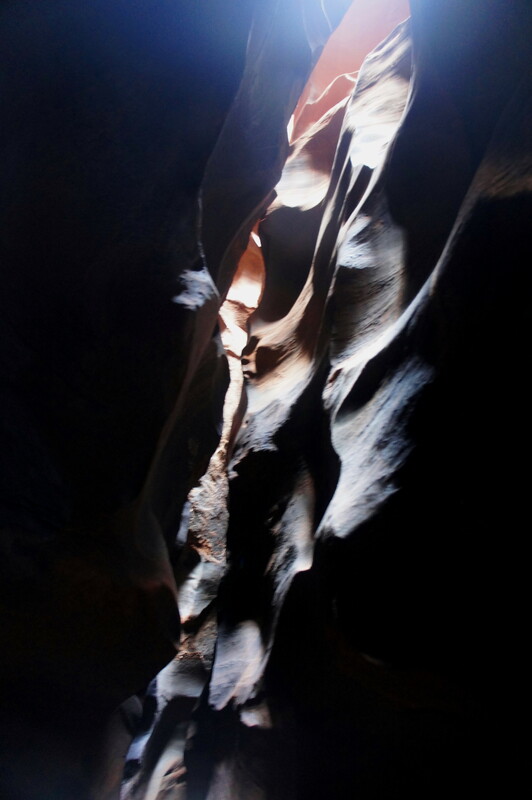 After the first Brimstone slot, the canyon gives way briefly to a sunny opening, then plunges right into a second—longer, deeper, darker, and narrower—slot section. In contrast with the orange, pink, and red hues of Peekaboo and Spooky, the coloration of Brimstone comprises darker browns, greens, violets, and even black. 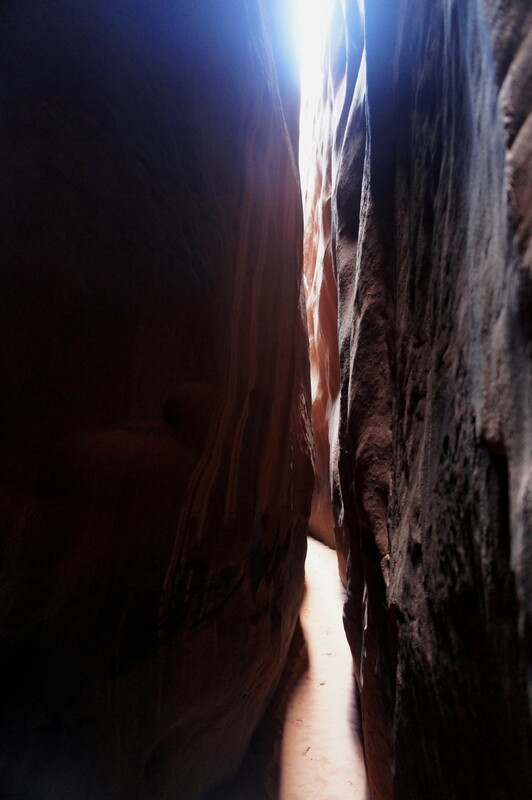 Here the slot is perhaps over 100 feet deep, leaving only small pockets of sunlight. Herein lies the rub: a few minutes into the second slot section, just as the canyon thins to as little as 2-3 feet wide, you are likely to encounter a lengthy, chilly pool. Here hikers face a choice: trudge through the often frigid waters, with a stunning subway section and ever-thinner narrows beyond, or, of course, turn around. (Note: Alas, upon my visit in March 2015, the pool extended for maybe 50 yards, and water temperatures perhaps barely crested 40 degrees. So after venturing in a little ways, the loss of sensation in my toes forced me to turn around.) Some may not have to make such a choice: if the water is covered with a thin layer of ice, calling it quits is a no-brainer; conversely, in the summer months, the pool may be completely drained, posing no such barrier to hikers. 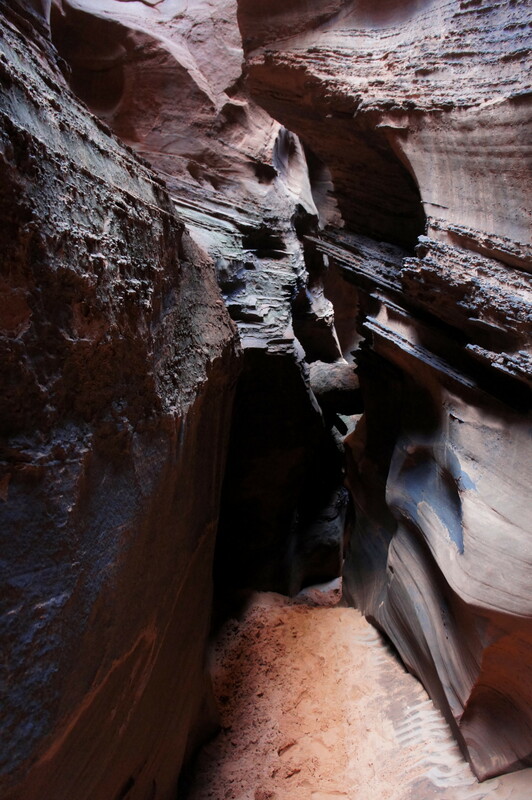 Either way, save for the most ardent of canyoneers and climbers, progress will be stopped shortly after the subway section, where the canyon walls narrow to as little as six inches. Venture into this claustrophobic crack at your own risk—but know that the ultimate way out will be to retreat the way you came. The return journey can be just as scintillating as the approach, with different views of the twisting slot from a variety of angles. From the start of the slot, allot at least an hour for the return—gaining around 350 feet in elevation—back to the trailhead. 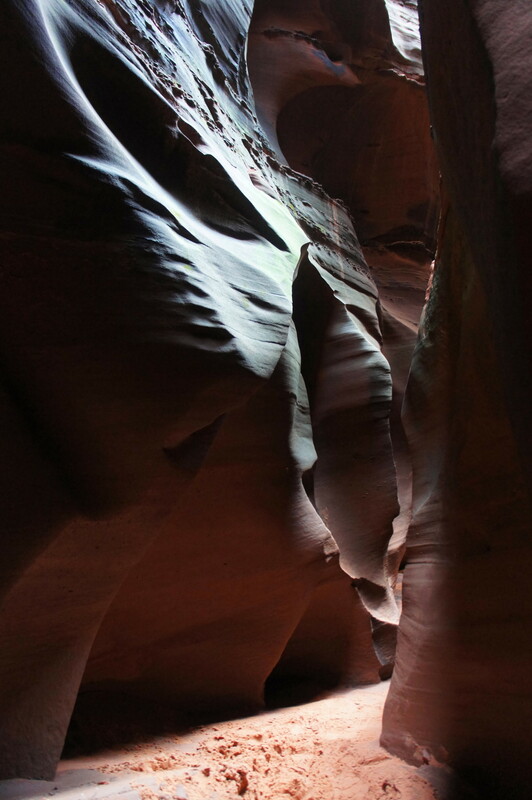 Brimstone is often combined into an action-packed day hike with trips into Peekaboo and Spooky slot canyons (a 1.5-mile, but slow and strenuous, loop) and the nearby Dry Fork Narrows. Try them all and report back: which do you feel is the best? None are likely to disappoint. This entry was posted in Grand Staircase-Escalante National Monument, Moderate Hikes, Utah and tagged best slot canyons, Brimstone, Brimstone Gulch, Brimstone slot, canyon, Dry Fork of Coyote Gulch, Dry Fork Trailhead, Escalante, Grand Staircase-Escalante, Hole-in-the-Rock Road, Narrows, Navajo sandstone, Peekaboo and Spooky, slot, Utah. Bookmark the permalink. Looks like an amazing slot! Outstanding photos!